The Influencer Podcast | Listen Free on Castbox. WHAT YOU’LL LEARN: Amanda Mueller overseas affiliate, brand, and influencer relations, and has worked with influencers like Summer Fridays’ Marianna Hewitt and Lauryn Evarts of The Skinny Confidential, as well as many micro influencers. On this episode, you’ll hear her brand perspective on what it takes to stand out among the saturation, connect with brands by doing more of what you’re already good at, and build strong relationships during your collaboration. For exclusive content surrounding this and all podcast episodes, sign up for our amazing newsletter at www.theinfluencerpodcast.com. And don’t forget to snap and post a photo while listening to the show and tag me (@julssolomon)! To dive deeper into each episode with myself and other podcast listeners and receive exclusive bonuses relating to the show come join the Influencer Podcast Facebook group. One more thing! Make sure you subscribe to the podcast to stay up-to-date on the latest influencer insights and strategies. WHAT YOU’LL LEARN: Cassie Brady is a fashion blogger and student in my Pitch It Perfect program who’s debunked the myth that you need tens of thousands of followers to land paid brand collaborations. In this episode, she shares her monetization journey and how she used the tools I teach in Pitch It Perfect to start negotiating her worth. Want to be the next Pitch It Perfect success story? Enroll today and get instant access to the strategies and templates Cassie uses to monetize her influence: pitchitperfect.net. For exclusive content surrounding this and all podcast episodes, sign up for our amazing newsletter at www.theinfluencerpodcast.com. And don’t forget to snap and post a photo while listening to the show and tag me (@julssolomon)! To dive deeper into each episode with myself and other podcast listeners and receive exclusive bonuses relating to the show come join the Influencer Podcast Facebook group. One more thing! Make sure you subscribe to the podcast to stay up-to-date on the latest influencer insights and strategies. In this episode, I fill you in on how you can transform your pitching strategy and start landing the brand deals you know that you were meant to. HINT: sometimes it involves bringing it back to the basics. Also, learn more about my brand new masterclass and how you can snag several bonus trainings from some of the leaders in the influencer industry. For exclusive content surrounding this and all podcast episodes, sign up for our amazing newsletter at www.theinfluencerpodcast.com. And don’t forget to snap and post a photo while listening to the show and tag me (@julssolomon)! 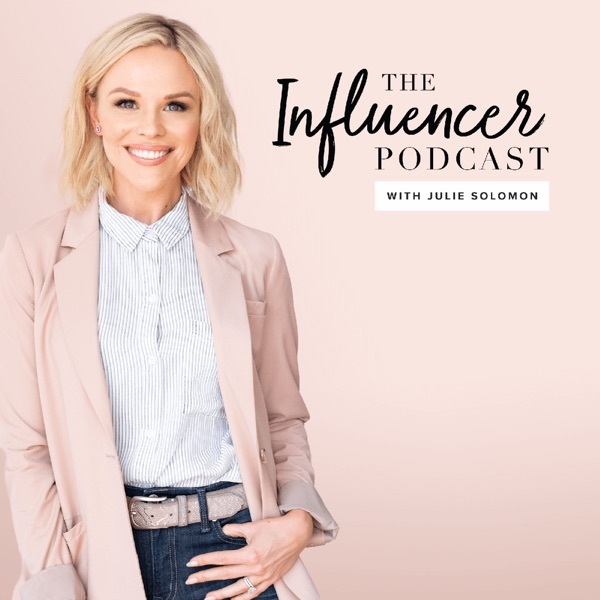 To dive deeper into each episode with myself and other podcast listeners and receive exclusive bonuses relating to the show come join the Influencer Podcast Facebook group. One more thing! Make sure you subscribe to the podcast to stay up-to-date on the latest influencer insights and strategies. WHAT YOU’LL LEARN: Using the strategies I teach in Pitch It Perfect, Stefanie and Caleb grew their lifestyle brand into a successful platform that allowed them the freedom to quit their day jobs and go full-time. In this episode, they share how transitioning to a personal completely changed the game, how to overcome fears and limiting beliefs, and exactly how they harnessed Pitch It Perfect to score a 5-figure month based on brand deals alone. Want to be the next Pitch It Perfect success story? Enroll today and get instant access to the strategies and templates Stefanie and Caleb used to triple their business growth: pitchitperfect.net. For exclusive content surrounding this and all podcast episodes, sign up for our amazing newsletter at www.theinfluencerpodcast.com. And don’t forget to snap and post a photo while listening to the show and tag me (@julssolomon)! To dive deeper into each episode with myself and other podcast listeners and receive exclusive bonuses relating to the show come join the Influencer Podcast Facebook group. One more thing! Make sure you subscribe to the podcast to stay up-to-date on the latest influencer insights and strategies. WHAT YOU’LL LEARN: After inviting my community to send me their pitching questions, I noticed a lot of shared struggles. Questions about how to monetize in different niches, how to land and close deals, and how to negotiate rates. I see variations of these questions come up again and again, which is why my intention is to address these common conundrums once and for all—so that you can transform your influence into a sustainable and profitable business. Tune in to hear my answers to your questions. If you want to dive deeper into these topics after the show, check out my program Pitch It Perfect at pitchitperfect.net. For exclusive content surrounding this and all podcast episodes, sign up for our amazing newsletter at www.theinfluencerpodcast.com. And don’t forget to snap and post a photo while listening to the show and tag me (@julssolomon)! To dive deeper into each episode with myself and other podcast listeners and receive exclusive bonuses relating to the show come join the Influencer Podcast Facebook group. One more thing! Make sure you subscribe to the podcast to stay up-to-date on the latest influencer insights and strategies. WHAT YOU’LL LEARN: In this episode, you’ll learn step-by-step how to craft an effective elevator pitch that engages new followers and lands high-paying brand deals. I also share examples of elevator pitches that do and don’t work. By the end of this episode, you’ll be ready to write your own pitch. For exclusive content surrounding this and all podcast episodes, sign up for our amazing newsletter at www.theinfluencerpodcast.com. And don’t forget to snap and post a photo while listening to the show and tag me (@julssolomon)! To dive deeper into each episode with myself and other podcast listeners and receive exclusive bonuses relating to the show come join the Influencer Podcast Facebook group. One more thing! Make sure you subscribe to the podcast to stay up-to-date on the latest influencer insights and strategies. WHAT YOU’LL LEARN: Selena Soo is a publicity and marketing strategist who helps entrepreneurs, experts, and authors reach and impact millions with their message. In this episode, we talk about not only the importance of building meaningful relationships with influencers and industry leaders—but how to go about it from a place of authenticity and service. Selena also shares what she learned on her own journey from burnt out and underpaid to thriving seven-figure business owner. For exclusive content surrounding this and all podcast episodes, sign up for our amazing newsletter at www.theinfluencerpodcast.com. And don’t forget to snap and post a photo while listening to the show and tag me (@julssolomon)! To dive deeper into each episode with myself and other podcast listeners and receive exclusive bonuses relating to the show come join the Influencer Podcast Facebook group. One more thing! Make sure you subscribe to the podcast to stay up-to-date on the latest influencer insights and strategies. WHAT YOU’LL LEARN: For the first 25 years of his life, Paul Fishman let fear hold him back and pushed his own happiness aside in favor of pleasing others. When he finally set boundaries and took ownership of his own life, he quickly stepped into his true purpose. Now Paul serves as an advocate for all people who need support honoring and loving themselves. On this episode, Paul talks about taking ownership of your life, showing up fully, and cultivating self love—and why these things are so important to create the business and life you really want. For exclusive content surrounding this and all podcast episodes, sign up for our amazing newsletter at www.theinfluencerpodcast.com. And don’t forget to snap and post a photo while listening to the show and tag me (@julssolomon)! To dive deeper into each episode with myself and other podcast listeners and receive exclusive bonuses relating to the show come join the Influencer Podcast Facebook group. One more thing! Make sure you subscribe to the podcast to stay up-to-date on the latest influencer insights and strategies. WHAT YOU’LL LEARN: In this episode, I share five steps you can take to start confidently booking speaking events. These steps walk you through what to do to get noticed, what to do once you’re booked, and how to mentally prepare moments before walking on stage. For exclusive content surrounding this and all podcast episodes, sign up for our amazing newsletter at www.theinfluencerpodcast.com. And don’t forget to snap and post a photo while listening to the show and tag me (@julssolomon)! To dive deeper into each episode with myself and other podcast listeners and receive exclusive bonuses relating to the show come join the Influencer Podcast Facebook group. One more thing! Make sure you subscribe to the podcast to stay up-to-date on the latest influencer insights and strategies. WHAT YOU’LL LEARN: In this episode, I share three things I’ve learned about influence throughout my journey with this podcast. These are things I’ve experience first-hand that work really well, and things that really don’t work. You’ll learn what it takes to grow and authentic following, how to make more time to create, and ways to diversify your revenue as a blogger and influencer. For exclusive content surrounding this and all podcast episodes, sign up for our amazing newsletter at www.theinfluencerpodcast.com. And don’t forget to snap and post a photo while listening to the show and tag me (@julssolomon)! To dive deeper into each episode with myself and other podcast listeners and receive exclusive bonuses relating to the show come join the Influencer Podcast Facebook group. One more thing! Make sure you subscribe to the podcast to stay up-to-date on the latest influencer insights and strategies.